Drew brees of the New Orleans Saints (left) and Cam Newton of the Carolina Panthers (right). 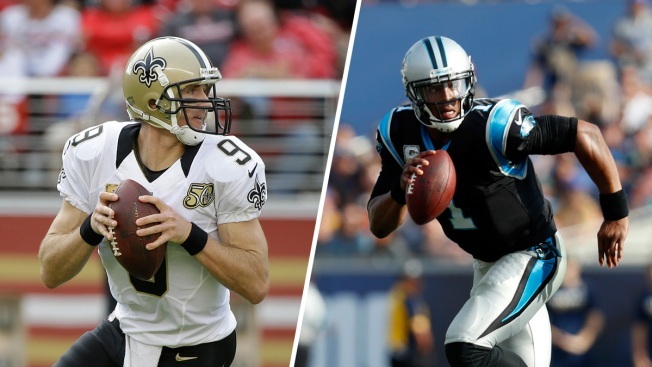 It’s week 11 of football season and the New Orleans Saints and Carolina Panthers are battling it out for the big win. Even if you don’t have tickets to the game, we have got you covered with the top bars to cheer on your favorite teams. Bourbon Street Bar & Grille, 346 W. 46th St., is a hot spot for all things NOLA. Fittingly, it is also the home of the New Orleans Saints. Enjoy happy hour until 8 p.m. or sip on one of their 25 bourbons. Mix it up with their Bourbon Mint Julip cocktail made of muddled mint, simple syrup, and bourbon. Amity Hall, 80 W. 3rd St., is the official home of the Carolina Panthers. Thursday nights are beer and burger nights from 5 p.m. to 11 p.m. and you can grab the special for just $15. The bucket specials are all day or purchase a happy hour pitcher of beer for $5 or $20. Infirmary, 1720 2nd Ave., is owned by a New Orleans native and it's "where the saints go marching in." Try their Cane River Gumbo or Zapp’s New Orleans slow cooked potato chips with their Louisianna Purchase cocktail made of Cognac, Rye, Whiskey, Punt E Mes, Cherry Liqueur, Benedictine, Angostura, and Peychaud’s Bitters. Brother Jimmy's BBQ, 181 Lexington Ave., is a North Carolina BBQ bar and restaurant. Brother Jimmy's BBQ brings southern cooking to New York Panthers fans. Bar None, 98 3rd Ave., has some New Orleans food and drink specials of their own. Happy hour includes $18 for two pitchers of Bud/Bud Light drafts from 8 p.m. - close. Thursday night is also trivia night at Bar None. So grab a buddy and head to Bar None for a relaxed game night.